Buttermilk has long been used as a tenderizing marinade for fried chicken, so when we ran across recipes for buttermilk-brined turkey we thought it was a concept we’d like to try. We decided to test our brine on two different types of turkey – a minimally processed fresh turkey, and a frozen turkey that had been injected with up to 7% turkey broth solution. Both our turkeys turned out moist, tender and full of flavor without being salty, which is good news for folks who can’t find an unprocessed turkey and still want to give brining a try. 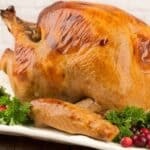 Our first choice when purchasing turkey has always been a minimally processed fresh bird, particularly when you are using a brine. If, however, you’d still like to try brining and you need to buy frozen, here are some guidelines for purchase. Most frozen turkeys are injected with a broth/salt solution that makes up about 7% or 8% of the bird’s total weight. Using our buttermilk brine for this type of turkey should not result in an excessively salty flavor ~ just reduce the kosher salt in the brine to 2 teaspoons. Note: We don’t recommend brining a turkey that contains higher than 8% solution. 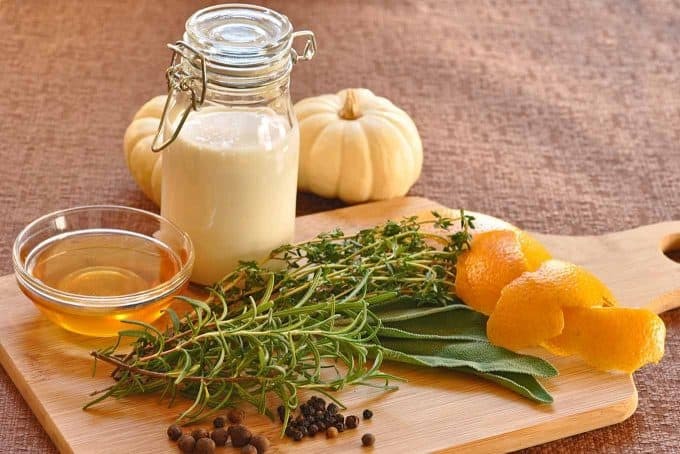 This flavorful brine is made with buttermilk, honey, whole spices, rosemary, thyme, sage and fresh orange peel. 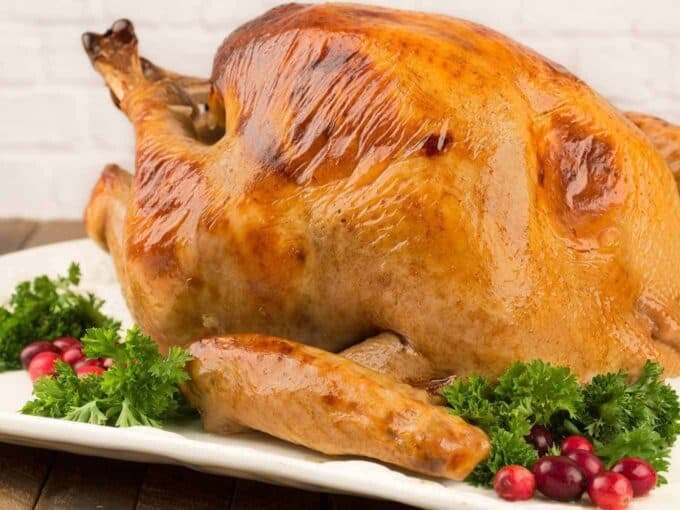 Our kitchen-tested buttermilk turkey brine produces a juicy, flavorful bird and, with a few adjustments, can be used on both fresh and frozen turkeys. Place the water, salt, sugar, honey and orange peel in a saucepan and bring to a boil. Cook for 2 minutes, stirring to dissolve the sugar and salt. Remove from the heat and allow to cool to room temperature. Remove the neck, giblets, liver, etc. from the turkey and reserve for gravy or stock (if using frozen turkey, be sure it has defrosted completely). Rinse the bird inside and out and pat dry. Place the allspice, peppercorns, thyme, rosemary and sage inside the cavity and put the whole bird in a large food-safe plastic bucket or brining bag. Combine the water-salt mixture with 1 quart of the buttermilk and pour into the bucket/bag with the turkey. Add at least 2-1/2 quarts of additional buttermilk. Make sure the turkey is fully submerged in liquid and the cavity is filled with liquid. If not, add more buttermilk. 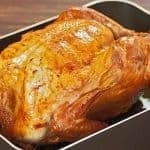 Cover and refrigerate for up to 18 hours. Remove the turkey from the brine, rinse, pat dry and discard the liquid. Season the cavity with salt and pepper and place the orange pieces, rosemary, thyme and sage inside. Tie the ends of the drumsticks together with kitchen twine. Set aside for about 1 hour at room temperature. Preheat the oven to 400°F and spray a roasting pan and rack with nonstick spray. Once the turkey has lost its refrigerated chill, work about 1/2 tablespoon of the butter under the skin on each side of the breast, massaging afterward to distribute the butter as evenly as possible. Take the remaining butter and rub it into the outer skin of the breast and each of the drumsticks. Place the turkey on the roasting rack breast side up. Form a piece of heavy-duty aluminum foil into a v-shape to shield the entire turkey breast from drying out and browning prematurely. Spray very thoroughly with nonstick spray and form the foil around the breast. Pour 2 cups of chicken broth into the roasting pan and place the turkey in the oven. 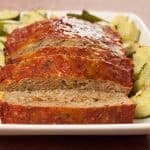 Roast for at 400°F for 30 minutes, then lower the temperature to 325°F and roast for an additional 1-1/2 to 2 hours, basting with the accumulating pan juices every 45 minutes. Remove the foil from the breast for the last 45 minutes of cooking. Test for doneness after 2 hours total cooking time using a reliable meat thermometer. When done, the internal temperature should be 165°F in the thickest part of the thigh. Allow to rest for a minimum of 20 minutes before carving. While the turkey is resting, skim any excess fat from the pan juices and add enough chicken broth to equal 3 cups of liquid total. Place in a saucepan and bring to a simmer over medium heat. In a small bowl, whisk together 1/4 cup cornstarch with 1/3 cup water. Add to the simmering broth and continue whisking until thickened. Season to taste with salt and freshly ground black pepper. Transfer to a bowl or gravy boat for serving. Used this recipe for my Thanksgiving turkey. Mine was minimally processed and since I am a big fan of buttermilk for cooking and baking I decided to give it a try. I was not disappointed ~ it was delicious and juicy.! This recipe sounds AMAZING!!! Maybe I will try it for Christmas. Ok, so hubby is the turkey lover in the family, so I might have to suggest this recipe to my in laws for Christmas dinner this year. this recipe for Buttermilk-Honey Brined Turkey looks like something I would fall in love with. The only way I like turkey cooked is roasted so brining with these flavors I love will only make it better. I’m a dark meat eater but if this keeps the breast moist I might even change my mind about this. The recipe looks easy enough to follow and it sure will be easy enough to eat! 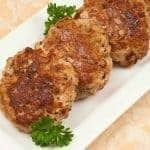 I tried this using pork meat to see how it would taste and I was not surprised when it tasted very good. I’m gonna use this recipe for my thanksgiving turkey. I’m definitely sure that my family will love it. I just have to make sure that my turkey is healthy, antibiotic-free and hormone-free. That way, I won’t be serving my family a dose of antibiotic that we don’t even need in the first place. So, please be careful when you buy a turkey for thanksgiving, make sure that it is healthy and raised naturally. We’re glad to know the brine works well for pork. Thanks for sharing that and the good advice on choosing a naturally-raised turkey for the holidays. We’re with you all the way on that! I had no tangy flavor to mine but used one of those live herb mixtures from the supermarket and put that in the brine. I was shocked how good this turkey came out. I also injected with a can of chicken broth. I actually overcooked the bird on the grill and it still came out moist and easy to carve. From now on I’m sticking with the buttermilk, which I only used for raw chicken in the past. I used a large turkey oven bag to brine in so less buttermilk was used. Hi Dennis ~ Great idea to brine in the bag! We’ll have to try that next time. Tried this brine on an “injected” frozen turkey and it turned out really well. I added some onion and garlic to the brine as well as the juice of the orange. The bird was moist even though I may have left it a bit long in the oven. I noticed a distinct but subtle tang from the buttermilk that is a definite change from my regular brining solution. I didn’t follow the gravy recipe exactly – left out the orange and used flour as a thickening agent. This gravy was definitely different from my regular turkey gravy, the buttermilk flavour really came through in the drippings. It was a nice change from my regular recipe and I think this would be lovely on chicken or even pork too. Glad the brine worked out for you. It took a little experimentation regarding the “injected” turkeys, but we were happy with this mixture. Buttermilk is a great ingredient and it does impart that subtle tangy flavor. I might try your suggestion and make a variation of this brine for pork chops. Thanks for the idea!